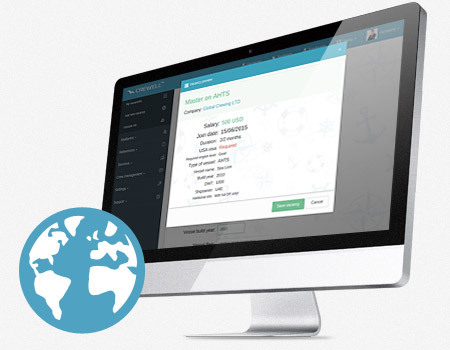 Our system contains unique tools helping seamen to manage a maritime career. In the "Seaman Account" you may fill in and edit your application form, as well as to prepare and store a complete pack of updated maritime documents. The best way to find a desirable job at sea is to monitor all vacancies published on Crewell.net and to apply online for suitable ones. Your CV goes under Employers consideration as soon as you click the button "Apply". It is really so easy! Personal must stay personal! Crewell doesn't content CVs of seamen in open access unlike most maritime internet sites and databases do! Your Surname, date of birth, maritime experience, contacts and other personal information are under your control and become visible to Employer only after your approval. 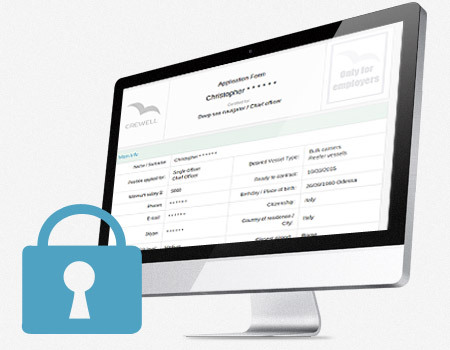 You can safely grant access to your maritime profile to crewing agencies and shipowners on Crewell, as all of them have passed the verification process before registering. 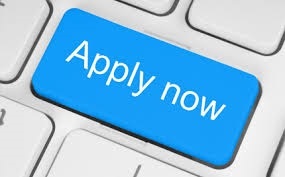 To offer your candidacy for vacancies and show your resume to the Employer, do not forget to make the appropriate settings in the seaman account, and also press the "Apply" button under the description of the suitable sea vacancy or accept job invitations. We’ve created a great unique online Crewell CV which is most comfortable for filling and editing and appreciated by maritime Employers. No more additional steps during filling of seaman application form. Crewell CV is like a usual paper Application Form. All information is collected on a single page. Just fill in all required fields and your CV is ready! If you have some changes you are free to edit your online CV any time. Remember that your CV is your main maritime document and it must be filled correctly! Congratulations, you may start applying to vacancies via Crewell! Be sure that you will not miss any new vacancy published on Crewell. 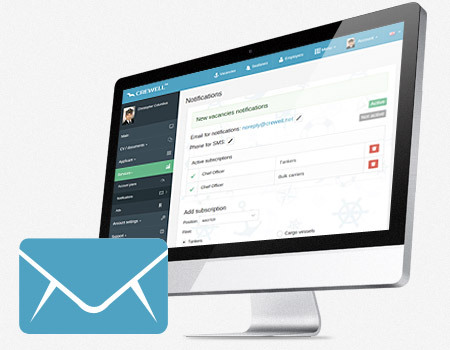 You have a great option to use all the services of vacancies notifications: E-mail notifications, Crewell Mobile application, RSS Feed, posts in social networks. You can easily be first applicant and get more chances to be approved by Employer. When you find a suitable vacancy don’t forget to push the bottom "Apply" under the vacancy details. Crewell informs you and confirms when you become an applicant for maritime vacancy. You can monitor the status of your CV In your seaman account. You will see when Employer has checked your CV. If Employer approves or denies some candidature the notification is also following shortly. You may communicate with your Employer via Crewell live chat – the quickest way of international connection. Just publish a maritime vacancy and thousands of seamen of all ranks will see it immediately! Crewell has thousands of seamen visitors every day, they constantly monitor all new vacancies publications. After posting a vacancy it will be seen by your potential marine employees in a very short time. Vacancy published on Crewell is additionally automatically sent to vacancies subscribers via email. It’s also shown in most popular social networks. So you can be sure that your vacancy is seen by everybody. 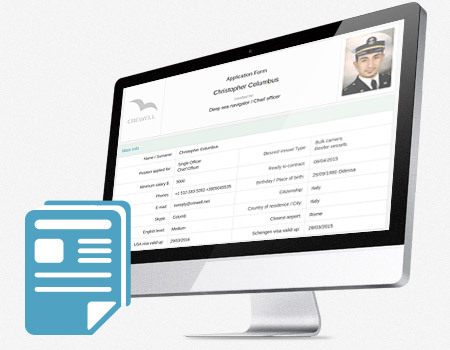 Crewell has the freshest ACTIVE database of maritime CVs on the market! Our modern technologies, fast development and appreciation of seamen from all around the world allowed us to gather the biggest active database of seamen which grows daily. 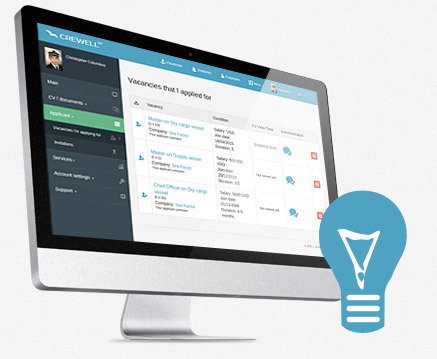 Just publish a vacancy - Crewell will propose you the most relevant and available CVs in seconds! Just publish a vacancy - Crewell will propose you the most relevant and available CVs in seconds! Universal CV may suit all of your needs. Get no more SPAM! Unique Crewell CV form is the most comfortable for filling for seamen, it also stays suitable and universal for many Employers. You can sort, print, download CV of any of your applicants. Scans of seafarers’ documents and performance reports are also available together with seaman application form. The same time you are finally free from diverse CVs and SPAM to your e-mail. All modern companies managers appreciate this way of work that reduces their spent of time and really volumes their effectiveness. 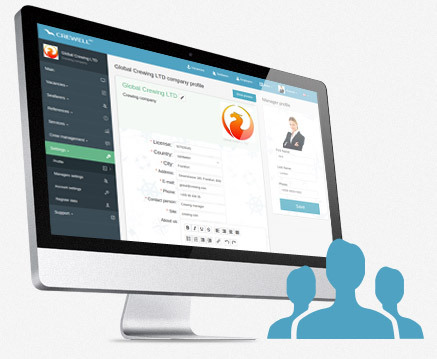 Joint company account allows working online for all managers simultaneously from any device around the world. All vacancies, candidates with managers’ comments and open chats are updating online. You can see any changes made by colleagues in real time. 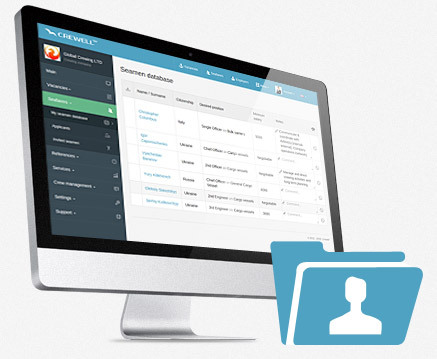 All your closed vacancies and candidates are saved in archive in order to work at them again when needed. 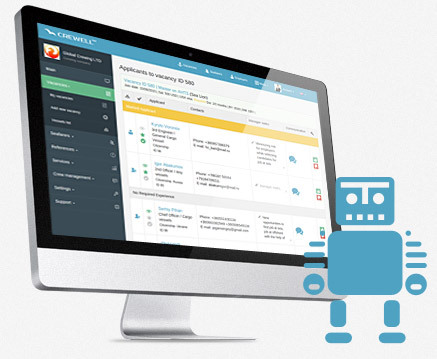 All of your candidates are automatically informed when you open their CVs. 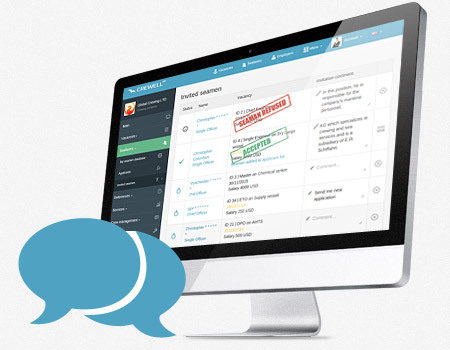 Online chat allows managers communicate with applicants right inside the system. There is no need to use international telephone and spend money and time any more. Crewell online chat is the quickest way to get more urgent information from your seaman. Time optimization and effectiveness of crewing managers are the basic tasks of Crewell. 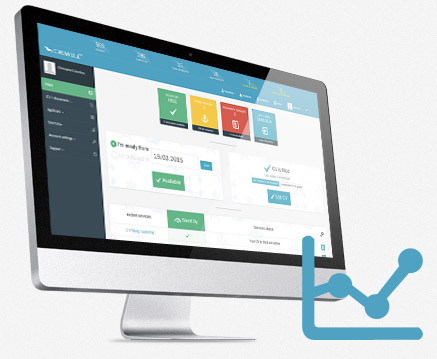 Our online intelligent system of «Smart selection» saves 90% of crewing manager time. 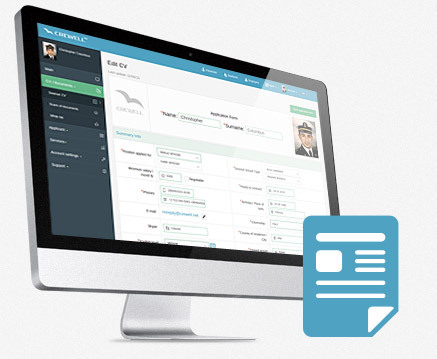 It automatically sorts your candidates depending on your vacancy requirements and their sea experience. Your list of applicants is sorted automatically: you will see the most suitable candidates for your vacancy with the same type of vessel and rank experience first and so on. Unbelievable, but It really works! * CV Mailing is not included! 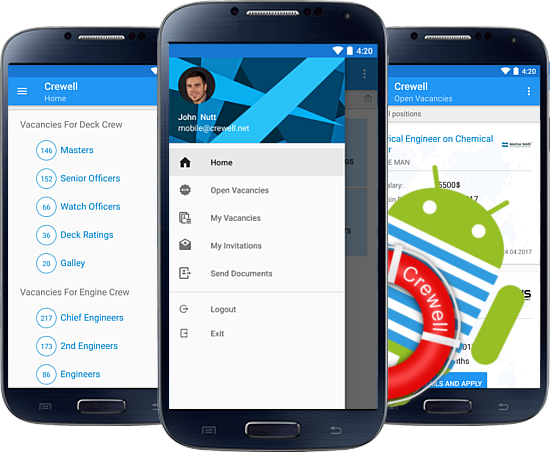 Crewell Mobile for seamen allows seafarers to keep up with the world crewing situation and don't miss any hot open vacancy for seamen. Any registered Crewell user can use Crewell Mobile for free! To Log In use your Email and Password from Crewell.net system. Crewell is a very useful site for job search. Simple for use and registration. It one of the best for rating among another maritime site in my opinion. Crewell has a handy app for Android. I like it. Thank you. Good site) Well done developers, it helps a lot to find a job !!! The best maritime site in Ukraine !!! I realy find this site one of the best in comunication between employers and sailors. Thanks a lot to CREWELL crew for give opportunities. Bless You. I found my last contract here! Very appreciate you! I am very happy to be part of Crewell and i am very thanksfull for giving me 5 USD. Hopefully in the next future i will get a good job vacancy in here. Join us NOW and find your dream job already today!